At Ford, Dean & Rotundo, P.A. we are devoted to representing elderly victims whose lives have been irrevocably changed due to medical malpractice, nursing home abuse, sexual abuse, catastrophic injury and neglect. We are proud of our record, of our tradition of excellence and the fact that our work has resulted in many victims receiving full compensation for their injuries and restoration of their dignity. 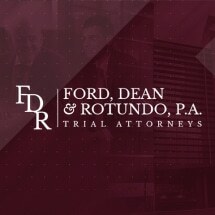 The law firm of Ford, Dean & Rotundo, P.A. is also proud of the attention and care we give our clients, the personalized service we provide, our ability to resolve cases swiftly and the fact that we receive referrals from attorneys across the state and country. Abuse and neglect of victims is a crime and should be considered as such. We litigate these cases as if they were criminal prosecutions and remain confident that juries will continue to award appropriate damages where the conduct of the defendant is abusive and grossly below acceptable standards. This is the mission statement of Ford, Dean & Rotundo, P.A. We handle cases on a contingency fee basis. Ford, Domnick & Wolf, P.A.